Did You See Us On MASHABLE? 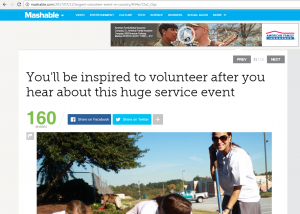 We have received quite a few inquiries since Mashable contacted us to publish information about Gwinnett Great Days of Service, the largest volunteer event in the country. We have answered inquiries about volunteer groups, project ideas, and great support as we enter YEAR 18. We invite you to reach out today and find out more. It’s as easy as 1-2-3! WHERE DO I SUBMIT A PROJECT? If you have any other questions, visit our Gwinnett Great Days of Service website, or call 770-995-3339. Look forward to seeing you signed up soon!